The archdiocese did publish an earlier newspaper, the Northwestern Chronicle, from the 1860s until 1900; however, Archbishop Ireland sold the paper to a Milwaukee publishing company because of mounting debt, according to church historian Father Marvin O’Connell. For 10 years, the archdiocese went with­out a newspaper until the summer of 1910, when Archbishop Ireland an­nounced at a clergy retreat his plan to begin publishing The Catholic Bulletin. The first issue of the eight-page weekly broadsheet — all text and no pictures — was mailed to 2,500 subscribers at an annual rate of $1.50. 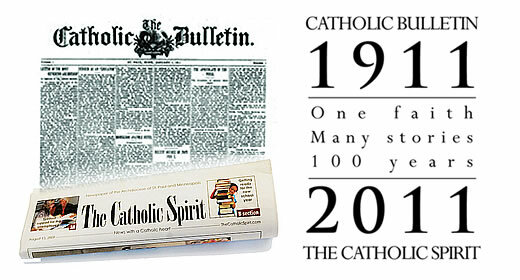 “In a word,” it said on page 4 of the first issue, “The Catholic Bulletin will have for its object to supplement the catechism lesson and the pulpit sermon, bringing each week into the family life not merely news of the Catholic world, but positive, clear, well-defined instruction in Catholic dogma and Catholic precept, affording its readers arguments in defense of the faith, building up in every Catholic the true spirit of religion and creating in every household a true Catholic atmosphere. During Father Reardon’s time as editor, each issue contained local, American and European Catholic news; a summary of secular news; Catholic literature reviews; a question-and-answer box; catechetical teachings; news from the mission lands; and family features. In the early years of the newspaper, when Catholics were a minority in a majority Protestant culture, an anti-Catholic sentiment pervaded society. “[T]he reading of Catholic newspapers, while giving readers ‘the pleasure of the fulness [sic] of Catholic life,’ will at the same time help to fortify them against the persistent and insidious attacks upon their faith which assail them both in the secular press and in their converse with others,” the column continued. There also existed the belief that Catholics were somehow un-American. Father Reardon used the newspaper to show that Catholicism was not only compatible with American culture but also a defender of American values. By the time Father Reardon stepped down as editor in 1922, he had increased the newspaper’s circulation ten-fold to 25,000. Today, The Catholic Spirit is delivered to 85,000 homes.